This tasty vegan Garden Veggie Tofu Scramble has been rocking my breakfast routine lately! It’s full of flavor, packed with protein, and a total breeze to throw together. Back in 2011, while raiding the Whole Foods Hot Bar for breakfast, I came across big ole pan of scrambled tofu. At the time I didn’t know this was a thing, and I was so excited to try it! I piled my box high with roasted potatoes, sautéed veggies, baked cinnamon apples, and a hearty scoop-o-scramble for good measure. It was love at first bite. SERIOUSLY! I know for a fact Paul would have loved it too had that mofo just sucked it up and tried a bite… but at least that leaves more for me! I’m not always the best at sharing my food anyways. I tend to guard my plate when it’s piled high with something delicious. The second he left for his two-week trip to Africa (um, jealous!) I spitefully made myself a big skillet of this garden veggie tofu scramble and proceeded to live off it for the next few days. It reheats marvelously by the way. Hellooooo meal prep rockstar! To say that I’m in love with this recipe is a bit of an understatement. I’m CRAZY for it! As most of you know I’m a fairly flexible omnivore but man oh man I can get on board with this vegan breakfast scramble. It’s flavorful, totally filling, and satisfies my goal of sneaking more vegan eats into our weekly rotation. Woot woot! Scrambled tofu is for sure an empty-the-garden or empty-the-crisper affair. All your favorite veggies can get in on the fun here and it’s a fabulous way to use up leftover bits of veggies that would otherwise go forgotten in the fridge. A little bit of bell pepper here, some onion there, you can even add broccoli, carrot, and mushrooms to the mix if you have them handy. Looking for an easy side dish option? I love serving this veggie tofu scramble with oven roasted potatoes dunked in spicy habanero salsa! This tasty vegan Garden Veggie Tofu Scramble has been rocking my breakfast routine lately! It's full of flavor, packed with protein, and a total breeze to throw together. Drain and crumble your tofu. Set aside. Next chop those veggies! I like to finely dice my onion, bell pepper, and jalapeño, then mince the garlic with a garlic press. Chop green onion or snip with a pair of kitchen scissors. Set aside. Heat a pan or skillet to medium-high heat and sauté onion and peppers until tender, adding garlic towards to the end to prevent burning. Add tofu, green onion, dijon mustard, turmeric, basil, salt and pepper. Use a spatula to mix and crumble while you sauté and scramble everything together. Cook until tofu has soaked up all the delicious flavors and is piping hot. Serve it up hot and ready with all your favorite breakfast essentials! If this isn't your first rodeo, nutritional yeast can also be added for a parmesan cheese-like kick of flavor. 1-2 TBSP should do great here! 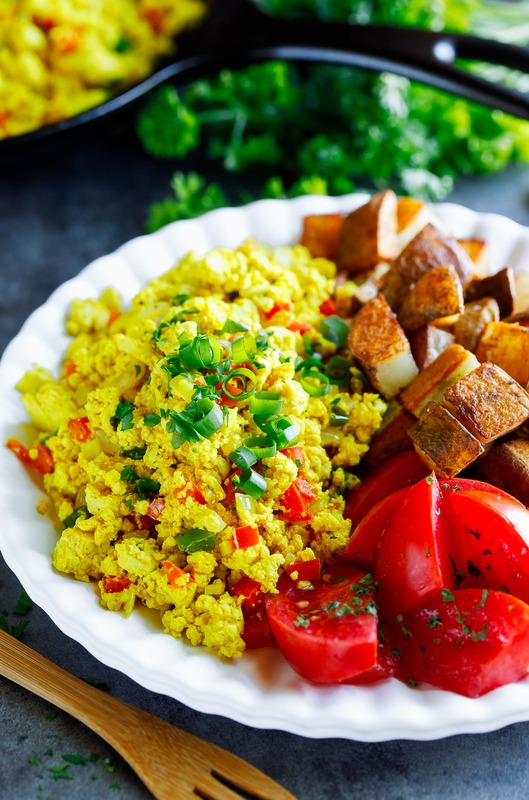 I love my tofu scramble alongside sea salted tomatoes and oven roasted potatoes with spicy red salsa or hot sauce for dipping! Coffee is pretty essential too! 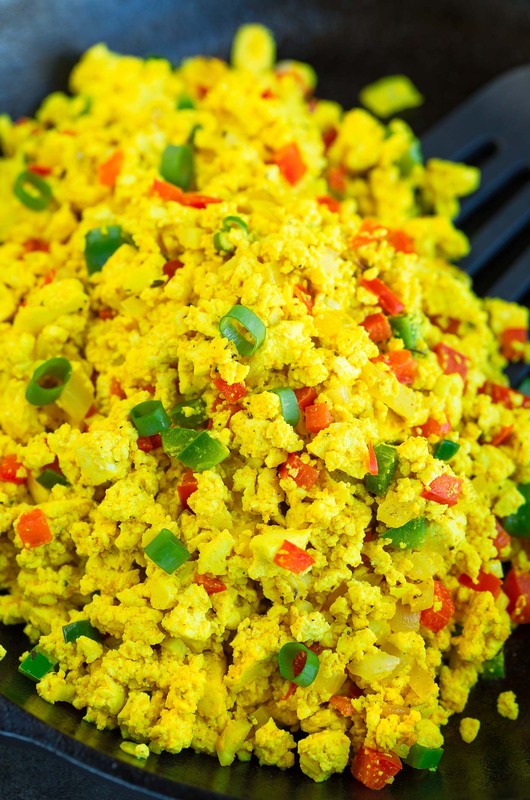 Tofu Scramble nutrition facts below are an estimate provided by an online nutrition calculator. In other news, yellow things are really freaking hard to photograph. As are scrambled eggs. (or “eggs” in this case) I give this bad boy the old college try and hopefully it’s deliciousness made it through in the photos! Forgive me if they’re technicolor – they’re really really ridiculously tasty, yo! Great flavou, first time making a tofu scramble and will be making it again. This is my favorite version of this. Seasoning seemed just right.I went for the nutritional yeast too. I had a variety of pre- roasted veggies I added in to it. When I am real organized, I put a bunch of veggies in the oven all at once and then use them in Sandwiches etc. for several days. I leave out oil and used a lite tofu, so calorie count really nice too. Love this easy, healthy, filling breakfast! Yum! 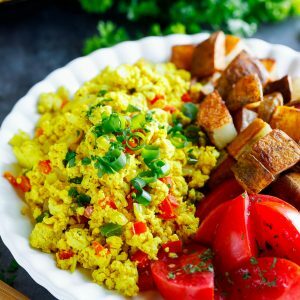 I never thought to use tofu in a scramble, but I love the flavor and protein this recipe packs!